A new report from leading international obesity experts gives eight point plan to reverse epidemic of type 2 diabetes within 3 years. Recommendations also call for labelling of added and free sugars on products in tea spoons for the public to understand, a complete ban of all sugary drink advertising (including fruit juice) on TV and internet demand services and a ban of companies associated with sugary products from sponsoring sporting events. 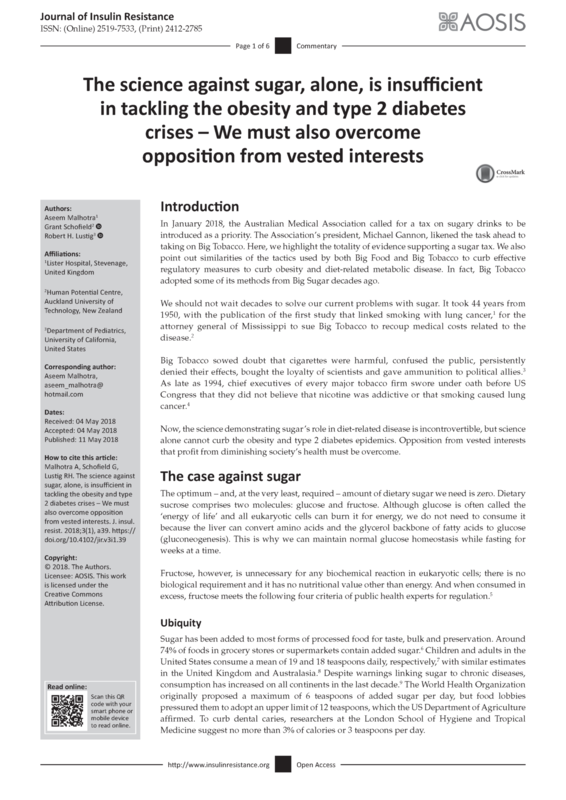 The authors state that the science against sugar alone is not sufficient to overcome the obesity and type 2 diabetes crisis, opposition from vested interests need to be overcome. The experts call for complete dissociation of dietetics organiZations from taking sponsorship money from food companies that market processed foods otherwise organizations such as the British Dietetic Association cannot claim their dietary advice is independent. The calls are backed by eminent international public health scientists including Professor of European Public Health Martin McKee, the Vice President of the UK Faculty of Public Health Simon Capewell, Professor of Food Policy at the Centre of Food Policy,City University of London,Tim Lang, and Policy Director of Baby Milk Action, Patti Rundall OBE. Three international obesity experts, NHS Consultant Cardiologist Dr Aseem Malhotra, Professor Robert Lustig of the University of California San Francisco and Professor Grant Schofield, Auckland University of Technology have authored the most comprehensive up to date report on the science of sugar with an eight-point plan that if implemented will result in a reversal in the epidemic of type 2 diabetes within 3 years. The peer reviewed academic publication entitled “ The science against sugar, alone, is insufficient in tackling the obesity and type 2 diabetes crises —we must also overcome opposition from vested interests” published in The Journal of Insulin Resistance makes comparisons with tackling the obesity epidemic with taking on Big Tobacco. “We should not wait decades to solve our current problems with sugar. It took 44 years from the 1950 publication of the first study to link smoking to lung cancer, to the attorney general of Mississippi suing Big Tobacco to recoup medical costs related to the disease. Big Tobacco sowed doubt that cigarettes were harmful, confused the public, persistently denied their effects, bought the loyalty of scientists, and gave ammunition to political allies” they write. The authors describe in detail and reference examples adopted by the sugar industry to deflect blame away from sugar’s role in obesity and type 2 diabetes which includes paying scientists, obfuscating scientific research, co-opting public health experts and influencing public opinion. “For years, soft drink companies’ public relations machinery, have pushed the lack of physical activity as a cause of obesity, when there is evidence to reveal that although sedentary lifestyle contributes to chronic disease physical activity, impact is minimal at best and you cannot outrun a bad diet. Beverage companies have sponsored numerous public health efforts provided they did not address soft drinks. Brenda Fitzgerald, the recently disgraced director of the U.S.Centers for Disease Control, had partnered with Coca-Cola’s Georgia’s public health commissioner, who also bankrolled the Global Energy Balance Network, a consortium of three academics, to push lack of exercise as the cause of obesity. Even Michelle Obama caved to food industry pressure; during the US president’s second term she shifted her focus away from the importance of a healthy diet toward promoting physical activity. The US Academy of Nutrition and Dietetics, British Dietetic Association (BDA), and the Dietitians’ Association of Australia all receive annual contributions from the food industry. It is extraordinary that the BDA has also promotedNestle Health Science on its homepage. Nestle has not only been a prominent marketer of sugary products for children, but it has also been the target of a boycott by respected international organization Baby Milk Action for contributing “to the unnecessary death and suffering of infants around the world by aggressively marketing baby foods in breach of international marketing standards”. These organizations are wittingly or unwittingly behaving more like front groups for the processed food industry —this must be exposed” they write. “Astroturf groups are ‘citizens’’ non-profit groups that mask their sponsors to appear as though they are grassroots organizations. For instance, in the U.S., the Center for Organizational Research and Education’s (CORE; formerly the Center for Consumer Freedom) name is deliberately designed to divert attention away from industry connection. It claims to be “dedicated to protect consumer choices and promoting common sense’. It is funded by fast-food, meat, alcohol and tobacco industries. The group was originally founded in the mid-1990s, using tobacco and restaurant industry money to oppose smoking restrictions in restaurants. Its founder, Richard Berman, also founded the American Beverage Institute, which fights restrictions on alcohol use and raising the minimum wage. In a secretly recorded interview reported by The New York Times, Berman encouraged industry players to attack those that oppose industry interests and they could either “win ugly or lose pretty”. Similarly in the UK, the Institute of Economic Affairs (IEA), an organization that describes itself to be “the UK’s original free-market think-tank” claims to be independent of any political party, group or organization. But in 2016, Transparify —which provides ratings of financial transparency of major think tanks —gave a ‘highly opaque’ zero score. The IEA have received undisclosed voluntary donations from a number of organizations including Big American Tobacco, Coca-Cola Great Britain and Ireland, and sugar manufacturer Tate and Lyle. As Transparify states: “The more lobbyists try to hijack the ‘think tank’ label in an attempt to mask their paid-for spin as research-driven advocacy, the more important it becomes for the think tank sector as a whole to fight back. The best weapon in that fight is transparency”they continue to write. “Twenty-five of the 30-year average increase in life expectancy in the past century can be directly attributed to public health measures that were underpinned by regulation, including safe drinking water, safer working environments, seat belts in cars, smoke-free buildings, and immunizations. The regulatory approaches that addressed the acceptability, affordability, and availability of tobacco have been the most important factor driving decline in cardiovascular disease (CVD) mortality since 1969. A public education campaign, combined with smoke-free building regulation, and banning of tobacco advertising, were important measures for reducing smoking prevalence, and in turn, reducing CVD. However, the taxing of cigarettes was responsible for the biggest impact, by far. Unfortunately, the increasing prevalence of obesity and type 2 diabetes driven by poor diet, and,in particular, sugar consumption, is costing billions to national economies every year, and resulting in loss of economic productivity. The experts provide an eight point public health intervention plan, all of which are evidence based to reduce population sugar consumption, and all of which were successful in curbing tobacco use which will start to show a decline in the prevalence of type 2 diabetes within 3 years if implemented. Education for the public should emphasize that there is no biological need or nutritional value of added sugar. Industry should be forced to label added and free sugars on food products in teaspoons rather than grams, which will make it easier to understand. There should be a complete ban of companies associated with sugary products from sponsoring sporting events. We encourage celebrities in the entertainment industry and sporting role models (as Indian cricketer Virat Kohli and American basketball player Stephan Curry have already done) to publicly dissociate themselves from sugary product endorsement. We call for a ban on loss leading in supermarkets, and running end-of-aisle loss leading on sugary and junk foods and drinks. Sugary drinks taxes should extend to sugary foods as well. We call for a complete ban of all sugary drink advertising (including fruit juice) on TV and internet demand services. We recommend the discontinuing all governmental food subsidies, especially commodity crops such as sugar, which contribute to health detriments. These subsidies distort the market, and increase the costs of non-subsidized crops,making them unaffordable for many. No industry should be provided a subsidy for hurting people. Policy should prevent all dietetic organizations from accepting money or endorsing companies that market processed foods. If they do,they cannot be allowed to claim their dietary advice is independent. We recommend splitting healthy eating and physical activity as separate and independent public health goals. We strongly recommend avoiding sedentary lifestyles through promotion of physical activity to prevent chronic disease for all ages and sizes, because “you can’t outrun a bad diet”. However, physical (in)activity is often conflated as an alternative solution to obesity on a simple energy in and out equation. The evidence for this approach is weak. 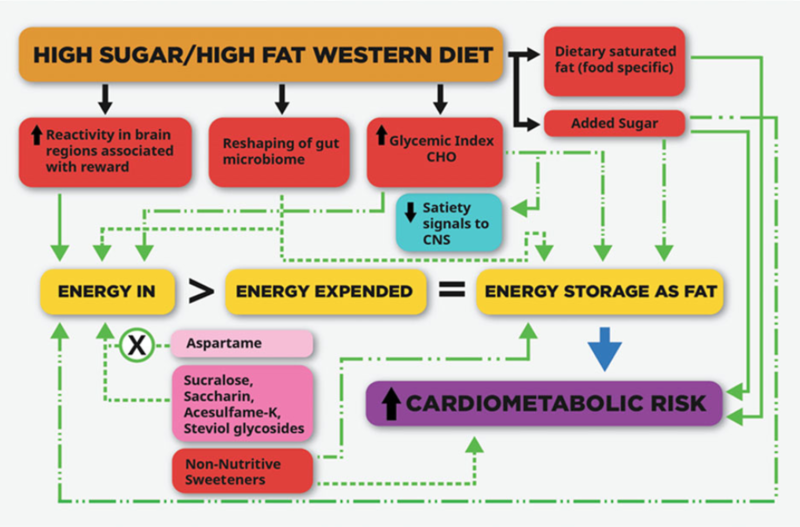 This approach necessarily ignores the metabolic complexity and unnecessarily pitches two independently healthy behaviors against each other on just one poor health outcome (obesity). The issue of relieving the burden of nutrition-related disease needs to improve diet, not physical activity. “Retrospective econometric analysis and prospective Markov modeling both predict that the prevalence of type 2 diabetes will start to reduce three years after implementing these measures. This calamity has been 40 years in the making—three years is not too long to wait” they conclude. S – Substitute ineffective interventions. “The 2005 satirical movie Thank you for smoking featured a triumvirate of tobacco, alcohol and firearms lobbyists, sharing their strategies at weekly meetings they call The MOD Squad (Merchants of Death). If the movie was remade today, a fourth member from Big Sugar would be mandatory. The analysis paper is available online at https://insulinresistance.org/index.php/jir/article/view/39 in the Journal of Insulin Resistance. NOTES:The Journal of Insulin Resistance(JIR) is a peer-reviewed, clinically oriented journal covering advances in disorders of insulin resistance. Articles will focus on clinical care and advancing therapy for patients with insulin resistance related disorders, such as obesity, metabolic syndrome, type 2 diabetes, cardiovascular disease, non-alcoholic steato-hepatitis, Alzheimer’s dementia, sexual dysfunction and other related disorders. Insulin Resistance includes pathophysiology, management, patient education, and treatment considerations for different patient populations. The journal will feature original research, reviews,editorials, case studies, and patient handouts. This will be of interest to medical practitioners, clinical educators, nurse practitioners and other health care professionals involved in the care of patients with disorders related to insulin resistance. 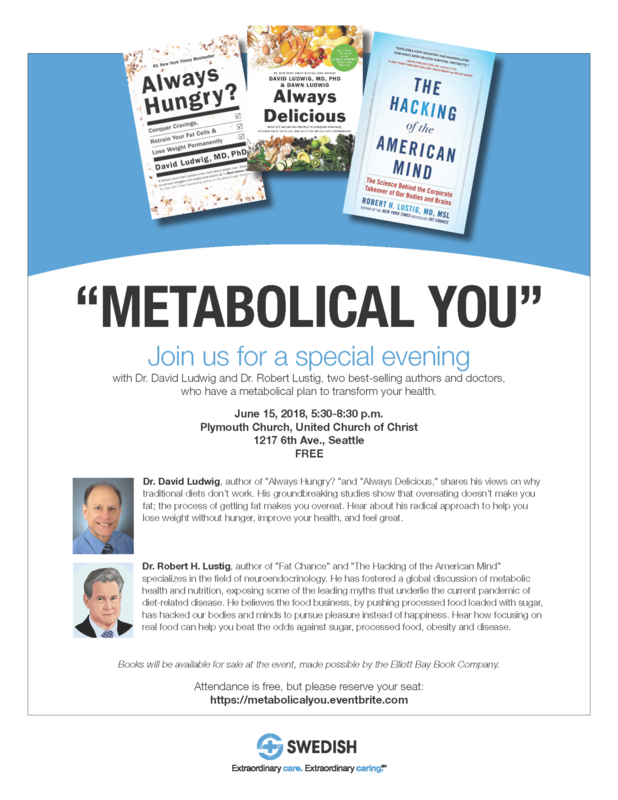 Looking forward to Metabolical You: an Evening with my colleague, best-selling author, and doctor, Dr. David Ludwig, hosted by Swedish Medical Center. 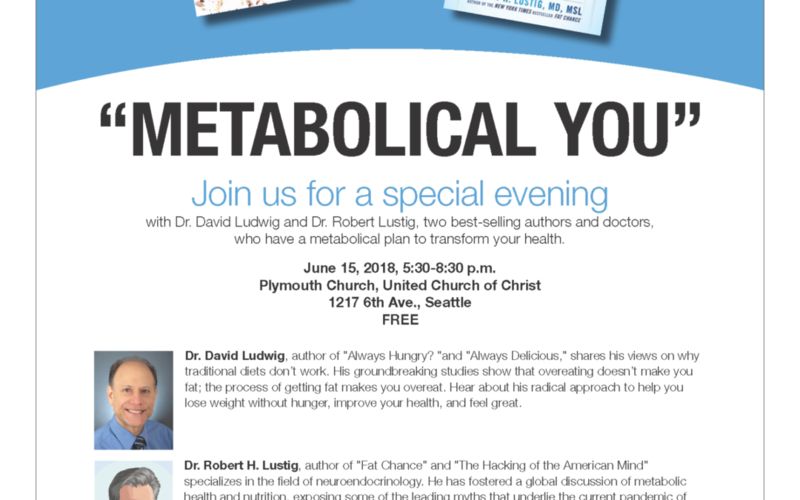 I’m in Seattle, June 15-16, 2018 for the Swedish CME summit for health care professionals: Metabolic Health and Nutrition Across the Life Span. 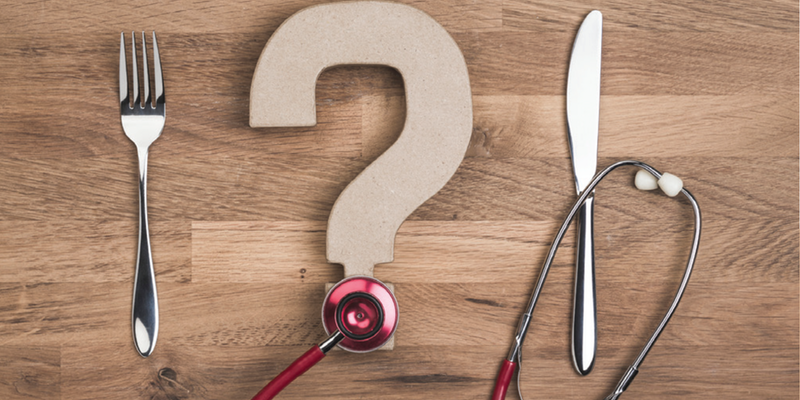 The stats on nutrition education in medical schools are getting worse not better – so the best place, right now, to educate healthcare professionals is in the “after-market” CME framework which is institutionalized and commonplace. This year (2018), the focus was broadened to Metabolic Health and Nutrition Across the Life Span. In addition to forging out-of-the-box concepts and themes of the CME summit, hosting and facilitating, etc., my colleagues recruited nationally and internationally known talent, and, in order to really bring together a blockbuster group, all speakers were asked to forgo their speaker fees, which they have done, both year one and two, an indication of how much “skin in the game” our CME summit faculty has. Check out the brochure for this event. 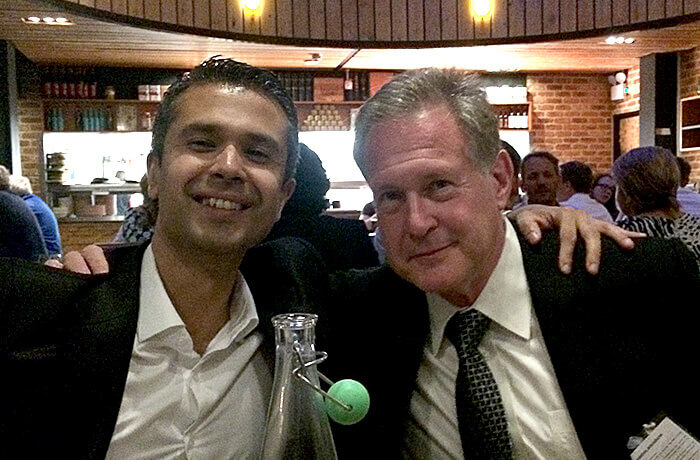 Recently, I shared information about the efforts of Dr. Aseem Malhotra in the UK. Here is the complete video recording of the presentation to the European Parliament. Dr. Aseem Malhotra spoke to the European Parliament, at the invitation of Nathan Gill MEP for Wales. Dr. Aseem Malhotra, an internationally renowned UK cardiologist and author of the Pioppi Diet, argued the case for lifestyle medicine and explaining why lawmakers need to change EU health policy. “Prescribed medications are estimated to be the third biggest killer, after heart disease and cancer. 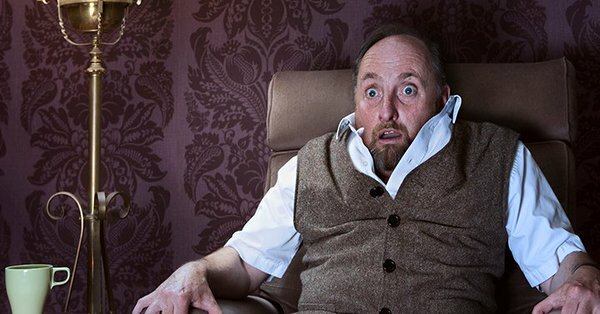 Bad Pharma sees millions taking drugs they don’t need – destroying their lives! For years public health advice across Europe has got it dangerously wrong,” Dr. Malhotra states. Dr. Aseem Malhotra is a leading figure in the campaign against sugar and too much medicine in the UK, and was joined by the director of the Centre of Evidence Based Medicine, University of Oxford, the past President of the Royal College of Physicians and former doctor to the Queen, a internationally known professor of Diabetes, an award winning investigative medical journalist, and an eminent UK nutritionist. The panel exposed how the food and beverage industry and pharmaceutical companies have had a pervasive influence over policy that coerces doctors into prescribing unnecessary and potentially harmful treatments rather than providing patients with basic lifestyle solutions. In the UK, more than half of all adults take at least one prescription medication with 50% of those over 70 on at least three. It is estimated that prescribed medication is the third most common cause of death after heart disease and cancer. The panel argued that evidence-based medicine has been hijacked by major conflicts of interest at the highest levels, and revealed unscrupulous lobbying practices that drive up profits at the expense of public health. The unified show of force was intended to expose collusion between politicians, respected medical institutions, ‘charities’ and medical journals for financial gain, resulting in an epidemic of misinformation with devastating consequences for health worldwide. Big Food and Big Pharma: Killing for Profit? UPDATE: Here is complete video coverage of “Big Food and Big Pharma: Killing for Profit? Dr. Aseem Malhotra is speaking to the European Parliament, at the invitation of Nathan Gill MEP for Wales. 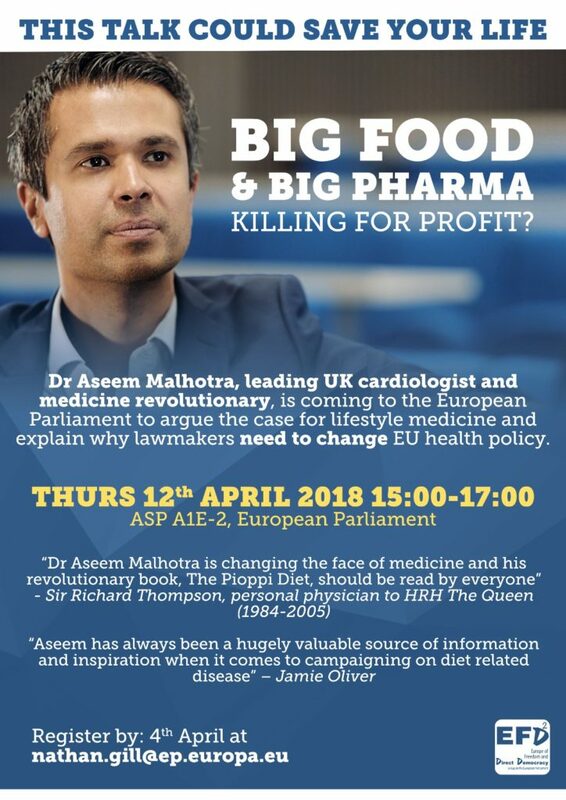 Dr. Aseem Malhotra, an internationally renowned UK cardiologist and author of the Pioppi Diet, will be arguing the case for lifestyle medicine and explaining why lawmakers need to change EU health policy. “Prescribed medications are estimated to be the third biggest killer, after heart disease and cancer. Bad Pharma sees millions taking drugs they don’t need – destroying their lives! For years public health advice across Europe has got it dangerously wrong,” Dr. Malhotra states. Dr. Aseem Malhotra is a leading figure in the campaign against sugar and too much medicine in the UK, and will be joined by the director of the Centre of Evidence Based Medicine, University of Oxford, the past President of the Royal College of Physicians and former doctor to the Queen, a internationally known professor of Diabetes, an award winning investigative medical journalist, and an eminent UK nutritionist. The panel intends to expose how the food and beverage industry and pharmaceutical companies have had a pervasive influence over policy that coerces doctors into prescribing unnecessary and potentially harmful treatments rather than providing patients with basic lifestyle solutions. In the UK, more than half of all adults take at least one prescription medication with 50% of those over 70 on at least three. It is estimated that prescribed medication is the third most common cause of death after heart disease and cancer. The panel will argue that evidence-based medicine has been hijacked by major conflicts of interest at the highest levels, and will reveal unscrupulous lobbying practices that drive up profits at the expense of public health. The unified show of force is intended to expose collusion between politicians, respected medical institutions, ‘charities’ and medical journals for financial gain, resulting in an epidemic of misinformation with devastating consequences for health worldwide. Facebook Event Link Here for more details. Promotional Facebook video of the event here. Ignore government guidelines to beat diabetes, obesity, heart disease and save NHS hundreds of millions, UK Prime Minister told. Government guidelines that advise putting starchy carbohydrates such as bread, pasta, potatoes and rice at base of a recommended diet have are described by Dr. Aseem Malhotra as a “35 year fad that has driven obesity related illness with disastrous consequences for public health”. By cutting sugar and starchy carbohydrates from his diet, Type 1 diabetic Nathan Gill, Member of the European Parliament (MEP) for Wales, has reduced insulin requirements by 50% and now urges Prime Minister, Theresa May, also a type 1 diabetic to do the same. New data from diabetes.co.uk reveals that 30,000 type 1 diabetics have reduced insulin requirements by up to 80% simply by cutting out starchy carbohydrates. MEP Nathan Gill was so astonished by the dramatic changes to his personal health after following eminent cardiologist Dr. Aseem Malhotra’s advice to follow a low carbohydrate high fat diet that he has written an open letter to the Prime Minister Theresa May calling for an urgent overhaul of dietary guidelines that promote low fat foods and advise putting starchy carbohydrates at the base of diet. “After reading eminent British Consultant Cardiologist Dr. Aseem Malhotra’s evidence-based lifestyle medicine book, The Pioppi Diet and having met Dr. Malhotra in person, I cannot express how much my life has changed for the better by following his recommendations that pinpoint sugar consumption above 2 teaspoons a day per adult as potentially damaging to health. Current Government guidelines have allowed for ten times this recommended dietary allowance. My blood sugars are not only significantly more stable, but I have managed to reduce my insulin requirements by almost 50% which, I’m sure you will agree, is quite extraordinary,” MEP Gill tells the Prime Minister. 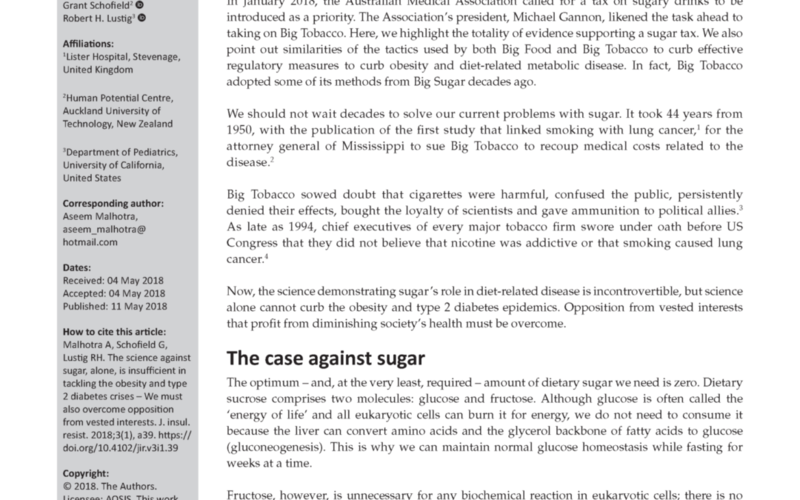 In the letter MEP Gill mentions that the harms of sugar consumption on health begin after consuming more than 2 teaspoons of sugar a day but research by Dr. Malhotra published in the BMJ in 2013 exposed that food labelling in the UK and Europe had in effect been advising the public to consume 22.5 teaspoons of sugar a day. Following an investigation by the Sunday Times and Channel 4’s Dispatches it later emerged that several members of the Government’s Scientific Advisory Committee on Nutrition had financial ties to sugar manufacturers. “Regulators, academic institutions, charities and organizations that have a responsibility to patients and should exhibit the highest standards of transparency and scientific integrity, instead of colluding with big pharmaceutical companies and the food and beverage industry for financial gain – to the severe detriment of public health. As a British citizen, a diabetic and as a politician I find this utterly unacceptable. Having personally improved my own health significantly by ignoring the official government dietary guidelines, which I have now clearly realized are not based on independent science, I urge you to do the same if you are not doing so already,” MEP Gill writes. On Thursday, April 12th, MEP Nathan Gill will host Dr. Malhotra in the European Parliament for a talk titled “Big Food and Big Pharma, Killing for Profit?” where Dr. Malhotra will make the case very clear for why the system needs reform, why lifestyle medicine must be at the forefront of improving global health, and what can be done to better inform the public. The letter and advice to support the diet and lifestyle recommendations of the Pioppi Diet and ignore current dietary government guidelines has been backed by a number of prominent doctors, dietitians, nurses and columnist and broadcaster Jon Gaunt who has reversed his type 2 diabetes. Christopher Gardner and his team are to be congratulated for completing this 12-month study, featured in the New York Times. It shows getting rid of processed food helps promote weight loss, irrespective of carb or fat composition of the diet. However, the Low-Carb diet was 30% carb, 45% fat. Most LCHF diets are 20% carb, 60% fat or more. I don’t think this study adequately tests Low-Fat vs. Low-Carb, and I don’t think you can dismiss insulin response as a triaging factor without an adequate Low-Carb diet.